The Sherry Spinner was devised long ago to imitate the female spinner of the familiar blue winged olive. Exciting times are had with this pattern late on summer evenings. Tail : Three pale or honey hackle fibres. Body : Orangey red floss, the colour of sherry. Wing : Pale hackle points. 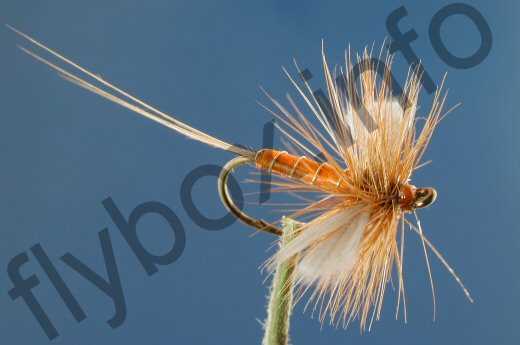 Hackle : Honey dun or light brown. Currently there are no comments about the Sherry Spinner fly pattern from other fly fishermen yet.